Dwayne Michael Carter, Jr., better known by his stage name Lil Wayne, is an American rapper. At the age of nine, Lil Wayne joined Cash Money Records as the youngest member of the label, and half of the duo, The B.G.’z, with B.G.. In 1997, Lil Wayne joined the group Hot Boys, which also included rappers Juvenile, B.G., and Turk. Hot Boys debuted with Get It How U Live! that year. Lil Wayne gained most of his success with the group’s major selling album Guerrilla Warfare, released in 1999. Also in 1999, Lil Wayne released his Platinum debut album Tha Block Is Hot, selling over one million copies in the U.S.
Lil Wayne Early Life: Lil Wayne was born Dwayne Michael Carter, Jr. and grew up in the Hollygrove neighborhood of New Orleans, Louisiana. Carter was born when his mother, a chef, was 19 years old. His parents were divorced when he was 2, and his father permanently abandoned the family. Carter enrolled in the gifted program of Lafayette Elementary School and in the drama club of Eleanor McMain Secondary School. He wrote his first rap song at age eight. In the summer of 1991, he met Bryan Williams, rapper and owner of Cash Money Records. Carter recorded freestyle raps on Williams’s answering machine leading him to mentor the young Carter and include him in Cash Money-distributed songs. He also recorded his first ever collaboration album True Story with rapper B.G.. At the time, Carter was 11, and B.G. was 14, and was billed as “The B.G.’z”. When he was 12, he played the part of the Tin Man in his middle school drama club’s production of The Wiz. He also accidentally shot himself with a .44 caliber gun at the age of 13, with the bullet missing his heart by two inches. At Marion Abramson Senior High School, Carter was an honor student, but he dropped out at the age of 14 to focus on a musical career. Lil Wayne Personal Life: Lil Wayne has four children. His first child, daughter Reginae, was born when he was 15, to his high school sweetheart Antonia “Toya” Carter (née Johnson). Wayne and Johnson married on Valentine’s Day of 2004 and divorced in 2006. Internet rumours started circulating in August 2008 that Wayne’s daughter had died in a car crash, which however he quickly cleared up as false saying “Please allow me to dispel any rumors or speculations and report that my daughter is alive, healthy and surrounded by family who care and love her dearly. The rumors are completely false and unfounded; neither Reginae nor any other member of my family has been involved in any car accident.” His second child, Dwayne III, was then born on October 22, 2008 at Christ Hospital in Cincinnati. His third child, Lennox Samuel Ari, was born to actress Lauren London on September 9, 2009. He had his fourth child, Neal, on November 30, 2009 with singer Nivea. In a CBS interview with Katie Couric, Wayne described why he goes by the name of “Wayne” instead of his given name, Dwayne. Carter explained, “I dropped the D because I’m a junior and my father is living and he’s not in my life and he’s never been in my life. So I don’t want to be Dwayne, I’d rather be Wayne”. Couric asked Wayne if his father knew of this and Wayne replied with a smile, “He knows now”. After earning his GED, Wayne enrolled at the University of Houston in January 2005. He dropped out in the same year. He also revealed on The View that he switched to the University of Phoenix and majored in psychology taking online courses. An article in Urb magazine in March 2007 asserted that Wayne had been earning high grades at Houston. Lil Wayne made his debut on ESPN’s daily sports round table show Around The Horn on February 10, 2009. Lil Wayne told CBS Evening News anchor Katie Couric on her All Access Grammy Special in 2009 that he enjoys smoking marijuana recreationally. He also stated that he is “not addicted” to drinking purple drank (codeine cough syrup) any longer, like some claimed he was. He has been arrested for use or possession of marijuana and other drugs. 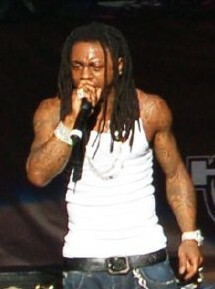 Following a performance at Qwest Arena in Boise, Idaho, Lil Wayne was arrested October 5, 2007 on felony fugitive charges after Georgia authorities accused the rapper of possessing a controlled substance. The incident was later described as a “mix-up” and the fugitive charges were dropped. On January 23, 2008, Lil Wayne was arrested alongside two others. His tour bus was stopped by Border Patrol agents near Yuma, Arizona. A K-9 Unit recovered 105 grams (3.7 oz) of marijuana, almost 29 grams (1.0 oz) of cocaine, 41 grams (1.4 oz) of MDMA, and $22,000 in cash. Lil Wayne was charged with four felonies: possession of narcotic drug for sale, possession of dangerous drugs, misconduct involving weapons and possession of drug paraphernalia. He was granted permission to travel outside of the state and remain out of custody on the $10,185 bond he posted. On May 6, 2008, Wayne returned to court in Arizona to plead not guilty to the charges. A bench warrant was issued on March 17, 2010 when Lil Wayne didn’t show for a final trial management conference. However, the rapper was already in prison, serving a year-long sentence in Rikers on weapons charges. On June 22, 2010 Wayne plead guilty to the charges. As part of the plea deal he may serve 36 months of probation. On June 30, 2010, he was sentenced to 3 years probation. On July 22, 2007, Lil Wayne was arrested in New York City following a performance at the Beacon Theatre; the New York City Police Department discovered Lil Wayne and another man smoking marijuana near a tour bus. After taking Lil Wayne into custody, police discovered a .40 caliber pistol on his person. The gun, which was registered to his manager, was in a bag located near the rapper. He was charged with criminal possession of a weapon and marijuana. On October 22, 2009, Lil Wayne pleaded guilty to attempted criminal possession of a weapon. He was due for sentencing in February 2010 and was expected to receive a one-year jail sentence, but on February 9, 2010, Lil Wayne’s attorney announced that the sentencing was delayed until March 2 due to dental surgery, which was performed on February 16. The surgery included eight root canals, the replacement of several tooth implants, as well as the addition of a few new implants and work on his remaining original teeth. On March 2, 2010, sentencing was postponed again when the courthouse reported a fire in the basement. On March 8, 2010, Lil Wayne was sentenced to a year in prison, which he served in Rikers Island. His lawyer said the rapper expected to be held in protective custody, separated from other prisoners. He was released on good behavior. However, in May 2010 Wayne was found by Rikers Island correctional staff to be in possession of contraband (an MP3 player, charger, and headphones). However at that time, it was reported by MTV and HipHopDX that Lil Wayne will be released in November which is four months early, which was true. In April 2010, Lil Wayne’s friends created a website called Weezy Thanx You, which publishes letters written by Wayne in prison. In the first letter, titled “Gone ’til November”, the rapper described his daily routine, saying he works out a lot, and reads the Bible every day. Lil Wayne was released from Rikers Island on November 4, 2010. On October 2009, Lil Wayne, Birdman, Cash Money Records and various music distribution outlets were sued for copyright infringement by Thomas Marasciullo, who claims his voice was used without permission. The rappers asked him to record some “Italian-styled spoken word recordings” in 2006. The lyrics were allegedly used on “Respect” and other tracks from the rappers’ collaboration album Like Father, Like Son and Birdman’s 5 * Stunna. They might think they’ve got a pretty jump shot or a pretty good flow, but our kids can’t all aspire to be LeBron or Lil Wayne. I want them aspiring to be scientists and engineers, doctors and teachers, not just ballers and rappers. I want them aspiring to be a Supreme Court justice. I want them aspiring to be President of the United States of America. My rap palate has greatly improved. Jay-Z used to be sort of what predominated, but now I’ve got a little Nas and a little Lil Wayne and some other stuff.